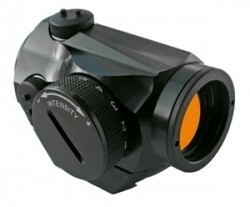 Designed with the hunter in mind, these sights are the lightest red dot sights tough enough to bear the Aimpoint name. Small enough to be used anywhere that you could put iron sights, these sights can be used on any type of firearm or archery equipment. A lightweight rilfe with the Micro H-1 mounted on it remains a lightweight rifle. ACET technology allows 50,000 hours of operation on one battery.